More than a year has passed since the end of the Enterprise's legendary five-year mission, and Kirk and his crew have settled into their new, separate assignments. 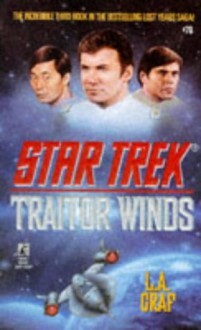 But Sulu and Chekov soon find themselves framed for murder and treason, and the two officers are forced to go into hiding. Admiral Kirk and Lt. Uhura frantically search for evidence to prove Sulu and Chekov innocent and uncover a plot that threatens the very foundations of Starfleet. The web of conspiracy is woven tighter as the real culprits and Federation agents close in on the fugitives. Unsure of whom to trust and with time running out, the former U.S.S. Enterprise shipmates must once again rely on each other to find the truth and prevent the Federation from facing utter destruction.